This portrait painting of one of my sons isn’t quite finished, but I hope to work on it once I’m done with another project. Painting with acrylics in portraiture art is my second love, my first being writing. 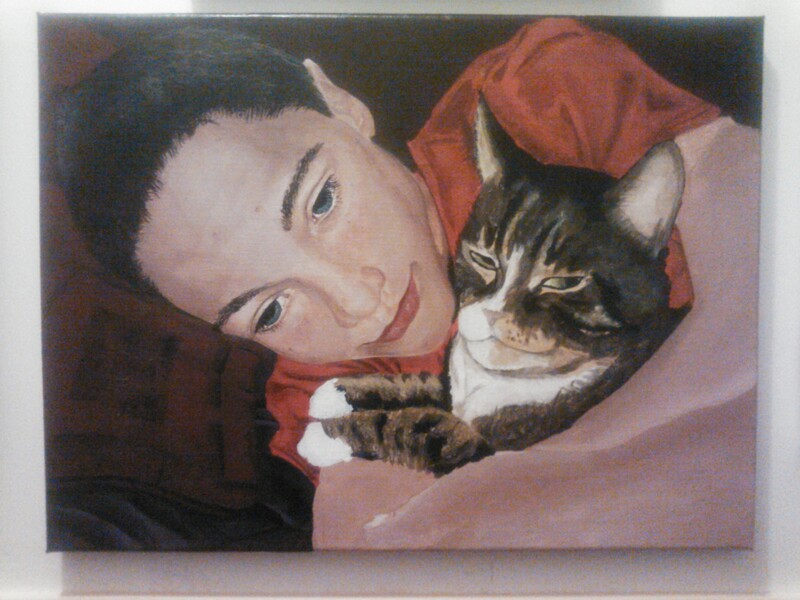 I’m sure you can tell the cat needs more detail and tweaking, too. I love the challenge of a getting skin tones right. It’s so very difficult to do. I used to paint with oils because the drying time allows for so much more leeway, but acrylics are easier in the end. I actually have 5 kids and they’re all teens. The oldest is 19. I can’t believe it myself. Where does the time go? And yes that is a recent photo, although I need to redo it since I had lasik surgery in the summer and don’t wear glasses anymore. Thanks Misty. How are you? I need to send out the usual ‘checkup’ for our group to see what you’ve all been up to.